Happy Spring! 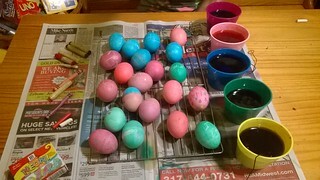 Hope everyone had a good Easter, or spring celebrations. Winter seemed to go by really fast this year; maybe, because it didn’t feel much like winter. We still have half of our wood leftover. Usually, when temperatures start to drop, I feel like hibernating. We have been so busy this year, time really flew. Well, we are officially on spring break for the next two weeks. WooHoo! It really couldn’t have come soon enough; we really need a break. 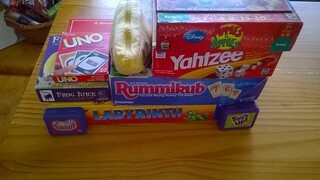 Though we will be off from homeschooling, I will be busy spring cleaning. I don’t want summer sneaking up on me like last year finding the girls without shorts to wear. I am also hoping to finally finish A Dance with Dragons. I am a little over 60%, or 700 pages, of the way through. I am finally caught up on where Feast of Crows ended. This story has been a bit slow for me to read because two of my favorite characters are not in it. I think I am also procrastinating because the next book in the series has not been released yet. I was really hoping to be done with our study of Austria before our break. We are oh so close, but we just couldn’t swing it. So, we will wrap it up when we come back. Though, I am still pretty happy with where we are in our lessons. Once we are all caught up in Austria, we are ready to move on to France, and the French revolution for world history and geography. The Mercy Street series has set us up to start our lessons on the civil war in American history, and we will continue exploring fairy-tales for language arts. I will also be adding in grammar lessons. I agree with them. I found myself again remembering why I don’t care for YA literature. Neither child wants to finish this series. We also finished Poison Apples. Sky had to explain to me what the Human Centipede reference was. I am glad we read this book of poems. They created quite a lot of discussion, though I would have been fine not learning about human centipedes. The girls wrote their reviews for the story Cinder. I read about Marie Antoinette from the book Live of Extraordinary Women. We listened to a Marie Antoinette (“Paparazzi” by Lady Gaga)Video by history teachers on Youtube. The girls came up with notes about her and added them to their timeline. 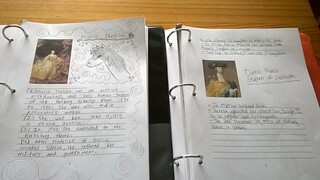 We watched the Documentary: The Vienna of Maria Theresa – YouTube, and the girls came up with notes to add to their timeline notebook. We also watched some of the girls favorite Easter movies. The girls did the 1-mile walk with yoga practice. and the girls enjoyed some new gifts. This week we met up with our local chapter of Navigators USA. They are a secular version of Girl and Boy Scouts combined (created by two Boy Scouts that didn’t like the way the scouts were heading). Navigators encourage the whole family to participate in activities together. The girls already know a few of the children from homeschooling gym, so my fingers are crossed this group will fill in our extracurricular activities box. For this book review, I will be reviewing Cinder by Marissa Meyer. This is book one of the Lunar Chronicles. The book starts off with the heroine named Cinder working at a stall in futuristic China as a mechanic. Her droid, Iko, is searching the market to buy a new foot for Cinder. Cinder is a cyborg. While working at the market, the prince Kai visits Cinder’s stall to see if she would fix his android, Nainsi. Soon after he leaves, the market closes because a deadly plague, called letumosis, has broken out. The plague ends up striking Cinder’s family, and Cinder’s stepmother, Adri, sends Cinder to be a part of the plague research. Meanwhile, Queen Levana, queen of Luna, the moon colony, is trying to take over all of humanity. I like the fairy-tale of Cinderella, but I don’t like science fiction. So, I found the whole aliens trying to take over the world boring. I thought the re-telling of Cinderella part was really good. If the author would have just left the plot like that, I would’ve liked it more, but the aspect of science fiction ruined the story for me. I give this story 2 out of 5 stars. I might recommend this story to people that like science fiction. Otherwise, I recommend reading the book Ella Enchanted instead if you are just looking for a re-telling of the fairy-tale Cinderella. 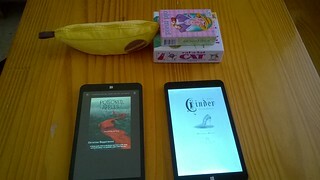 Today I will be reviewing the debut novel Cinder by Marissa Meyer , book one of The Lunar Chronicles. The story is set in Beijing, China’s future, where humans live along cyborgs and droids. Our main heroine, Linh Cinder, is a cyborg mechanic that has been hired to fix future emperor Kai’s android. However, a deadly plague is threatening to destroy humanity. One of Cinder’s stepsisters falls ill, and Cinder’s stepmother donates Cinder to the cyborg draft research program hoping to find a cure for her daughter. Meanwhile, queen Levana of Luna, the moon colony, is making plans to overtake Earth. I was never a fan of the story Cinderella to begin with, bullying is a very hard thing for me read. So, I wasn’t looking forward to reading another adaptation of the fairy-tale. That being said, I have mixed feelings about this book. This story deals with human experimentation and inequality problems, so some of it was hard for me to read. Also, the plot was overwhelming at times. There was so much going on at once, I felt like I couldn’t catch my breath! I’m also getting a little tired of villains being one-sided, where they are either too heartless or too whiny. I would like to see villains a bit more complex. Take Claude Frollo from Disney’s Hunchback Of Notre Dame, he could be cruel and conflicted at the same time, having more human like emotions. I felt Levana fell into the category of those same one-sided villain stereotypes, which was a little disappointing. I am willing to give the rest of the series a chance to see how Levana’s character progresses. Honestly, the only thing I really liked about this book was the ending. The rest was just okay. I give this book 3 and 1/2 out of 5 stars. Well, we had another break-in on our street this week. It happened between the hours of noon and 4 p.m. It really pisses me off. We are actually really good friends with our neighbors, and living here as long as we have, we know our surrounding neighbors, including those in the back of us, too. We all look out for each other. So, to hear our street is being burglarized during the day when a good amount of us are home, blows my mind. Our small town, I imagine it’s everywhere though, has a big heroin problem. Actually, not that many months ago there was a huge drug bust. The main dealer was a secretary for the police station, and the bust included dealers that worked prominent township high schools. This too boggles my mind. One thing history has taught me, is that we humans seem to always find ways of getting around laws. Take prohibition for instance, we knew the effects of alcohol. Yet not only did humans find ways of sneaking it, and allowed one of the most famous American gangsters to become rich, we created a sport out of it. NASCAR. Then there was the 60s, with humans still looking to find that buzz, because alcohol was no longer enough, and while trying to make these drugs illegal, we’ve again allowed gangsters to become rich. So, what do we do? Spend millions of dollars on a “just say no” campaign. Yes, it really seems to have worked too. I mean after all, it had worked so well in the past. Let’s see kids, “just say no” to street drugs, but since you can’t sit still in your seat during class, you need to take this. Of course heroin isn’t anything new, it just proves that we humans have a major weakness to want to alter our brains. The scientific part of me, wants to know why. I, for one am one American that is tired of seeing millions of tax dollars spent on band-aids. There is a problem here, one that has found its way into our neighborhood. 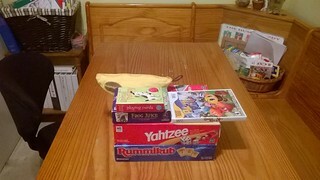 So, how does this week’s local event find its way into our homeschool discussions? 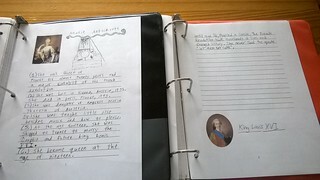 Better yet, how does this homeschooling mama tie this week’s local event in with this week’s history lesson about Marie Antoinette and the French Revolution? This and next week, we will be finishing up any loose ends before going on spring break. In other words, we won’t be starting anything new. We finished Cinder by Marissa Meyer. I don’t want to say too much about it, because the girls will be writing a critic of it next week, but the girls did not like it. I, myself found it entertaining enough. I can honestly say that for YA, it didn’t get on my nerves too much. I am curious enough to finish the series. Then again, I do like science fiction. 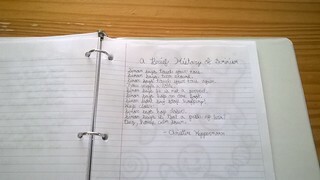 We continued reading the poems from Poisoned Apples by Christine Heppermann. We are just reading a few each day, and discussing their meanings. The poems have been a hit or miss with the girls, again though, in a good way. The girls really can’t connect well with them. There are a few though, where the girls really liked the symbolism. I am glad we are reading it. We started Splintered by A.G. Howard. This will be our last read before our spring break. Both girls are really enjoying this one. The girls copied A Brief History of Feminism from Poisoned Apples. Sky finished Kumon’s Pre-Algebra workbook 1. I am considering this as 1 math credit. Indiana has a weird credit system. You must have at least 40 credits to graduate. So, each semester equals a credit. I know Pre-Algebra doesn’t really count as “high-school” level work, and I do hope we get through Algebra 2. However, that would really be pushing it. Math is just not one of Sky’s strong points. Since she doesn’t want to go into mathematics or science fields, I really don’t understand why this is such a big deal. I would much rather her be able to complete, and understand how to do her taxes than solve an algebra equation, but I’ve vented down that road already. Little Sis is continuing with double digit multiplication. We will not be starting any new math work until after our break. We finished the Princess Dairy about Marie Antoinette. The girls are really liking the diary stories. Sky actually asked to read Anastasia’s, which is kind of a big deal. 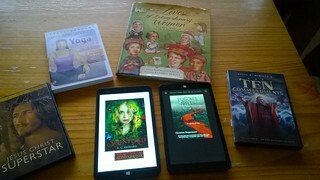 If you are not already familiar with the diary series, they have a brief biography afterwards of what ends up happening to the main character, and what was happening in history during that time, like the American Girl series. The girls learned about Marie Antoinette’s final fate. It explained how she, and her husband, was raised to respect etiquette more than learning how to run a country. Louis the 16th never saw outside of his court, meanwhile his citizens were starving. It was Sky that actually made the connection: “Wow, kind of like today.”. Okay, I am not saying Americans today have it as bad as during the French Revolution, but I do believe there are a few who need to step outside of their “courts” for a while. Especially, if they plan on running this country. It’s pretty easy to turn a blind eye and think that just because there are “facilities” available to help with mental health that the “average” person can actually afford, or will use them. It is my personal opinion, that until we can get to the bottom of drug abuse (mental health), we will never win the war on drugs. We watched Art & Propaganda ArtSleuth 4 – VIGÉE-LEBRUN: Marie-Antoinette and her Children -YouTube. This is actually a very interesting series. 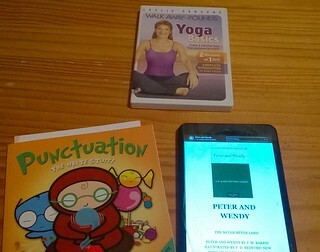 The girls had homeschool gym, and Yoga Walked. We watched the movie Pan. Sky would call this movie a “mind F”. It was a very interesting take on the story of Peter Pan, and that was the point of us watching it. Would I recommend it other than that? No. In honor of St. Patrick’s Day this week, the girls made green cake. 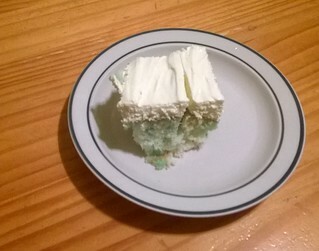 It is actually a jello poke cake with lime Jello. They did a really good job. The weather here this week was beautiful. I was able to open up some windows allowing the fragrance and sounds of spring to enter. I even got to dry our sheets outdoors. I love the smell of spring. The girls do too, and are beginning to get a bit restless. I tried lightening up our lessons so they could enjoy some time outdoors. I feel this is just as important as everything else. If there is one thing I did take with me from our Waldorf education days, it was the importance of rhythm. Just like our body survives on the inhaling and exhaling of our breath, our brain needs time to exhale as well. However, we only have two weeks left until our spring break. So, I am also trying to get any loose ends we may have, wrapped up. I have learned over the years though, that when the girls are distracted I might as well throw in the towel. There is no sense in swimming up stream if you don’t need to. This week we started reading Cinder by Marissa Meyer. We listened to Cinderella By Charles Perrault at Storynory, and watched Roald Dahl’s Revolting Rhymes_ Cinderella.mp4 – YouTube. We also started Poisoned Apples, Poems For You My Pretty by Christine Heppermann. The photography in this book is beautiful. I think, I will have the girls copy a few of these poems during the next two weeks. There is so much in these poems to discuss. The first poem is about anorexia. In a good way, the girls don’t really connect to most of these poems. They don’t have a bad self image, because no one has ever made them feel bad about themselves. This is one, of many, positive side effects of us homeschooling. They’ve been given the freedom to discover themselves without ridicule. They are old enough to understand that making fun of someone is a form of bullying, and if there is one thing the girls hate, it’s bullies. I find it odd, that we’ve become a society that thinks bullying is just a normal part of life that children need to face. I mean, if they don’t get bullied in school, how will they ever learn to stand up for themselves? The girls have never been bullied, and I can tell you that both girls know how to stand up for themselves just fine, in fact probably better. When watching The Christmas Story, they always comment on how mean everyone is to each other. “So, this is suppose to be normal? Explain exactly how this is suppose to be normal?” Honestly, I can’t. I am so proud of them, they are so much more mature than I ever was at their age. Keep questioning the status quo my loves. We continued reading Basher Punctuation. 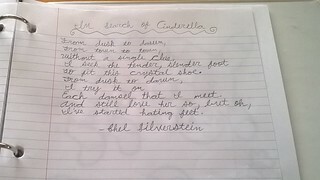 The girls copied the poem In Search of Cinderella by Shel Silverstein. 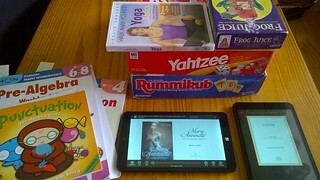 The girls warmed up at XtraMath, and continued with their workbooks. Little Sis is multiplying two digits by digits now. We read this month’s issue of Science in the News (A to Z), and looked at pictures of this week’s solar eclipse. Of course, we watched the last episode of Downton Abbey. We also started reading The Royal Diaries: Marie Antoinette. This has been a good contrast to our fairy-tails. As well as containing subject boards at Pinterest, I also have a What about Earth board that I add pictures related to the countries we are learning about. This helps the girls understand the countries better. Like, what they eat, or wear, monuments, or anything that helps bring that country alive. I also have a Herstory, and a Vintage Fashion board. This helps the girls learn history from a different perspective, and we had lots of discussions about fashion this week. In fact, I have a feeling this will be one of Little Sis’s history electives for high school. 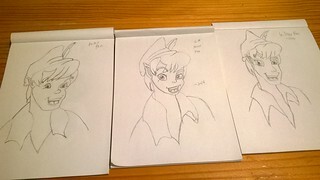 We watched different variations of Cinderella by watching the movies Cinderfella, and Disney’s live action Cinderella. (Which was very well done.) We also watched Happily Ever After – Cinderella YouTube – that was an animated Mexican version of the story. Theater Appreciation (Small Screen) : We watched Faerie Tale Theatre 19 Cinderella -YouTube. 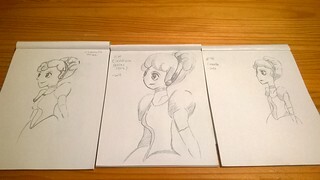 We tried drawing an anime version of Cinderella, How to Draw ANIME CINDERELLA from Disney’s Cinderella – @dramaticparrot – YouTube. This is Sky’s favorite style to draw. Anime is actually hard to draw. So, I was quickly reminded why I don’t like belonging to on-line homeschooling groups. In the small amount of groups that I do belong to, there has been huge new member growth. I rarely answer questions. Instead, I use them more for informational purposes. Sometimes though, I read a post that reminds me of where I once was when first starting out homeschooling. In a particular post, a mother sounded desperate for help to get her son reading. Usually, the posts are very vague in details, in this case it was the age (discovered later to be 8). However, having a child that did not care too much for reading, and still doesn’t really (Me, have a child that doesn’t like to read? ), I thought to lend some helpful advice. For starters, I honestly could care less whether a person uses my advice or not. I do however, get a little peeved when a parent sees the problem to be only with their child, and doesn’t see that the problem could be with their approach, and uses words like “pointless” to describe what you just recommended. I mean after all, “this approach” has been done successfully for years, how could it possibly be wrong? It must be my child. I blame the internet really, it is filled with tons of homeschooling blogs trying to sell you their way. This approach over here, says television, or “screens”, bad (Been there, done that). That approach over there, says “twaddle”, bad (Yep, been there too.). Thing is, if it wasn’t for “screens”, or “twaddle”, it would have been much, much, much harder for my children to *want* to learn to read. How could this, or that blog, know how your child learns best? I, only know what works best for us. The little advice I do give out to newbies, is observe your child, each one individually. Forget “school” lessons for now, get to personally know what makes your child tick. What makes them smile, what makes them cry, what makes them excited beyond belief? In order to do this, you will need to expose your children to other, sometimes “pointless” things than what you, yourself just enjoy. You will need to step outside of your comfort zone. The best advice I ever received, that finally set me on the right path, was that my child is not me. No, one person, has all the answers. Parenting, and homeschooling became much easier, once I stopped thinking that I did. 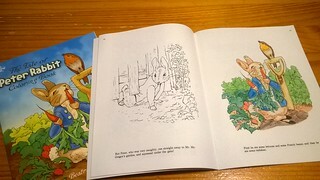 After reading it, and doing a little research, I don’t think the story was intended for children. I believe, from what I read, someone enjoyed reading about Peter Pan from one of Barrie’s adult novels, and wanted to make it into a play. The book was then released after the success of the play. 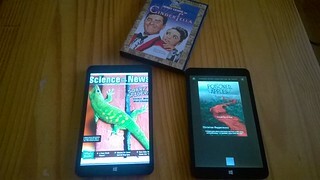 We read while listening to the dramatic audio reading from LibriVox (another way to get a child interested in reading), the narrator is a friend of ours, and is homeschooled. We also continued reading Punctuation. 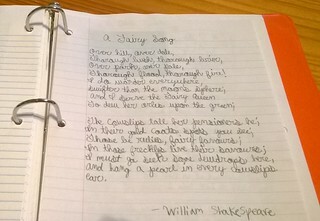 The girls copied the poem, A Fairy Song by William Shakespeare. 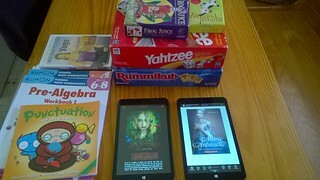 The girls warmed up with XtraMath, and continued in their workbooks. We watched Neil deGrasse Tyson explain Leap Year. We watched a Crash Course video laying out the basics of The Holy Roman Empire. Charles V and the Holy Roman Empire: Crash Course World History #219- YouTube. We watched a really good movie called To Be, or Not To Be starring Mel Brooks and real life wife Anne Bancroft, my favorite actors after James Stewart. (Netflix, and I think Amazon Prime streaming). Though it is not bad for young children, I don’t think they would understand it much. This movie is more than just a satire of WW2, it actually has quite a lot of history, and inspired lots of discussion. 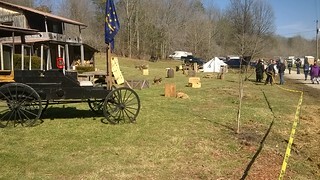 We attended our local maple syrup festival. They reenacted a western shoot out this year. 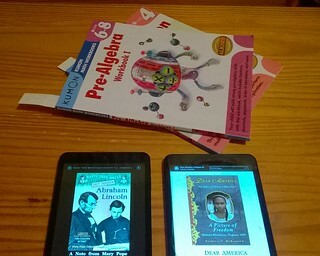 We read The Magic Tree House Fact Finder book about Abraham Lincoln, and the Dear America diary, A Picture of Freedom. I highly recommend this Dear America story. It was by far the best story we read this week, and inspired *lots* of discussion. I will warn you though, it did not sugar coat slavery. There is death, beatings, and attempted sexual assault. I would place this series as the next stepping stone after American Girls. We listened to the song Swing Low, Sweet Chariot by The Plantation Singers (beautiful). 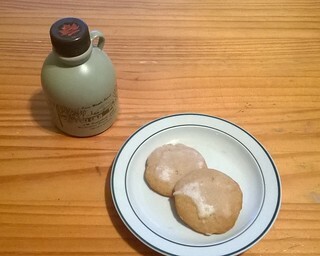 The girls made our annual maple syrup cookies, with maple syrup icing. Since I’ve started practicing yoga everyday, my sciatic nerve pain has gone away. I think my hamstring, and gluteal muscles were tight from my back surgery, and not being able to stretch them out. Yoga has helped with Papa’s arthritis in his joints too. The girls also love to practice on their own. We watched the movie Ella Enchanted. It reminded me more of a Shrek rip off, than the actual story. We attempted Peter Pan, DramaticParrot – YouTube.